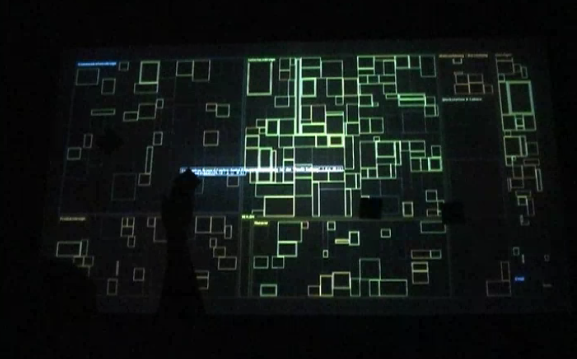 incommon is a space-filling, collaborative data visualization for the mæve multitouch table. Built with processing using the reactivision framework. It was developed by Vanessa Schomakers under supervision of Prof. Boris Müller and Till Nagel in the context of the course »Begreifen!« at the University of Applied Sciences Potsdam in Spring 2009. »incom« is the communication platform of the design faculty of the university of applied sciences potsdam. It is an in-house development based on PHP. The so called workspaces are a part of this system, where students and lecturers organize a course and communicate about it. A workspace has members and posts. Almost every course is represented by a workspace. Mainly they are categorized by the subject groups of the curriculum. As every student and lecturer has his or her own profile it seems only natural to provide an individual access to the table. Every user gets his or her own fiducial object. It is a small card with a fiducial code on the one side and the user icon from incom on the other. As incom provides a web frontend it is not obvious how students actually collaborate. 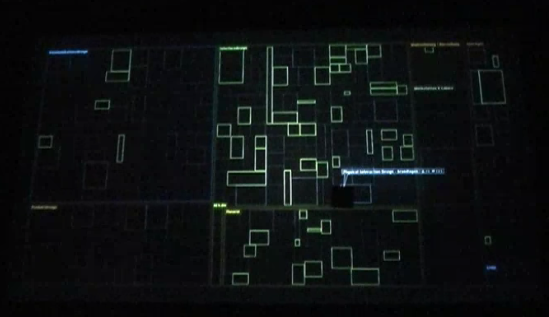 The main idea is to provide a different access to this data and - hopefully - discover new patterns or gain new insights into the hidden structures of incom. 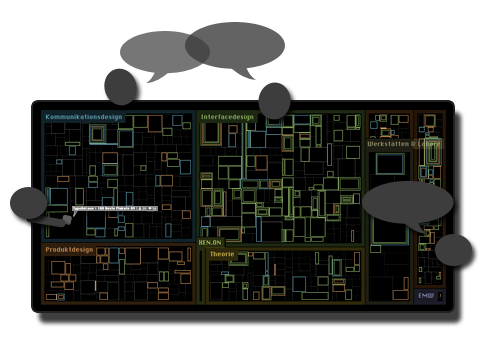 All the workspaces are visualized as a treemap. They are divided into categories according to their subject group. The size of the tiles depends on the sum of the members and the amount of posts it contains. By this, one gets a impression on how popular or important the single workspace is. 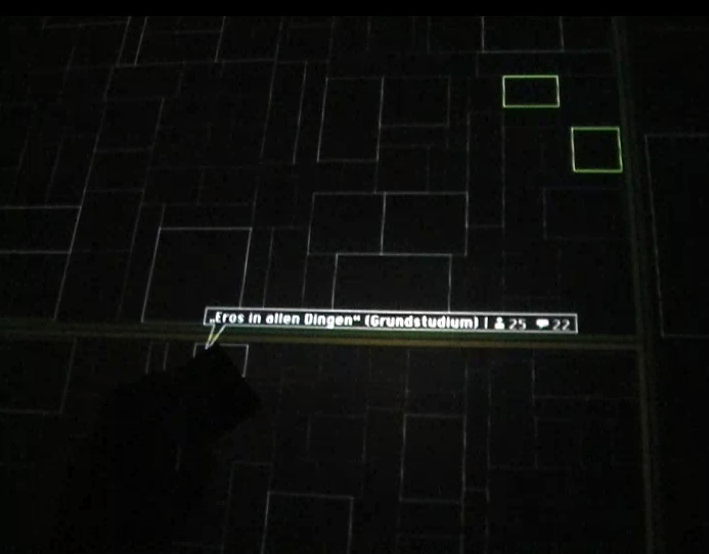 When a user places his or her token on the table, the corresponding workspaces are highlighted. The color depends on the course of studies. If there are users "on board" who are members of the same workspace, the outline is added inside of the workspace tile. Like this the students can see which workspaces they have in common. By moving the fiducial over the workspace tiles the workspace title and additional information like the number of users and posts is displayed. incommon from Vanessa on Vimeo. Special thanks to Tina Deiml-Seibt, Tobias Friese, Denny Koch, Till Nagel, Marcus Paeschke, Stephan Thiel and Christopher Warnow for all the technical support! And thanks to the rest of the course for the moral support! And thank you, Curtis, for the marvellous song "move on up"!